On December 24, 2018, about 1344 eastern standard time, a Cessna 172N, N3015E, was substantially damaged during a forced landing near Ft. Lauderdale, Florida. The flight instructor, student pilot, and two passengers were not injured. Visual meteorological conditions prevailed, and no flight plan was filed for the local instructional flight. The airplane was owned by Air Con LLC, and operated by Airplanes 4 Rent, under the provisions of 14 Code of Federal Regulations Part 91. According to the flight instructor, they were flying along the shoreline at 800 ft above ground level (agl). The engine started to vibrate and then experienced a complete loss of power. The flight instructor tried to restart the engine twice, but the engine did not start. He set up for an emergency landing on the beach. At 200 ft. (agl) he noticed a pier and knew he had to fly over the pier to make a safe landing on the other side. He tried to restart the engine for a third time and the engine restarted but did not produce power over 1200 rpm. Once over the pier, he saw people on the beach and decided to land in the ocean. 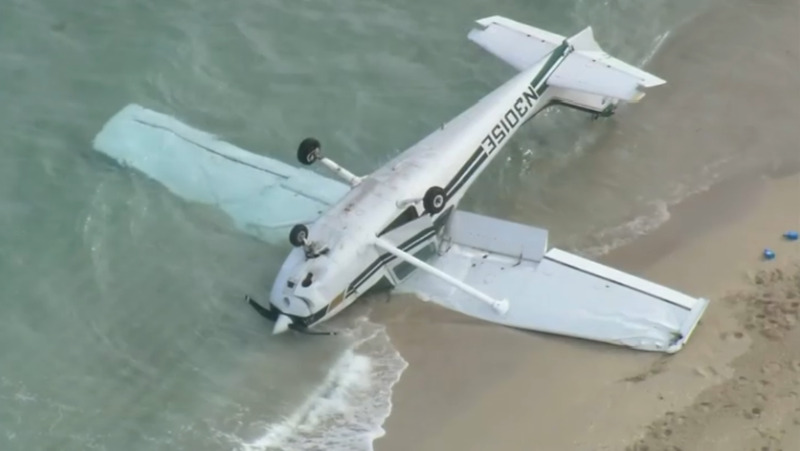 When the main landing gear touched the water, the airplane immediately flipped over. All four occupants egressed the airplane. Examination of the engine revealed that the No. 2 exhaust rocker arm stud fractured. Engine continuity was established by rotating the propeller by hand and visually verifying that the pistons and push rods moved on all cylinders. The four-seat, single-engine, high-wing airplane was built in 1978, and equipped with a Lycoming O-320-series engine. The most recent annual inspection was completed on December 19, 2018. At the time of the inspection, the airframe total time was 5295.0 hours and the engine had 1568.7 hours since major overhaul. 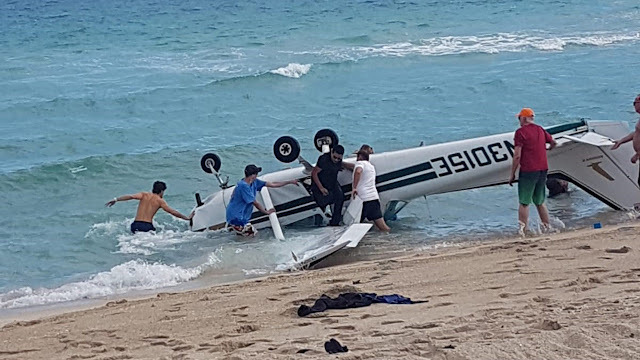 According to the airplane owner, he purchased the airplane in February 2018 from AIG insurance as a salvage purchase. The airplane was located in Belize City, Belize. The airplane was damaged by a trolley that rolled into it and damaged the left-wing strut, rudder and elevator. He flew down, repaired the airplane, and flew it back to Fort Lauderdale. He performed an annual inspection in May 2018 and put it into rental service at that time. The airplane flew for 218 hours before the accident. The flight instructor held a commercial pilot certificate, with a rating for airplane single-engine land, and airplane multi-engine land. His most recent Federal Aviation Administration first-class medical certificate was issued on October 26, 2017. He reported 1,580.5 total hours of flight experience at the time of the accident.